At some point during your survival mission you’ll probably need to summon help from rescuers. As a survivor, you’ll firstly want to get a potential rescuer’s attention and then to be able to send them a message that they can clearly understand. There are many methods of signalling for help but in a survival situation, you’re probably going to be extremely limited. Therefore, visual signals such as fire or by using a mirror or some other kind of reflective material, such as a steel knife, for example, are probably going to be your best bet. It’s extremely important that you try to put yourself in the rescuers’ position when it comes to signalling for help. There’s precious little point in building a fire in the middle of a dense forest as the smoke is likely to get trapped underneath the tree cover so you need to ensure that the area you choose is easily visible from the air, sea or nearby land and that it’s fairly close to where you’ve built your shelter so that rescuers know where to find you. A clearing in the forest, on a hilltop or by a beach or lake shore all fit the bill. 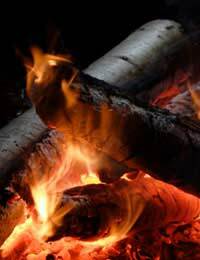 Many people choose to build a fire for warmth and for cooking on whilst in the great outdoors and it’s simply not enough to hope that flames from the fire will be perceived by potential rescuers as a ‘cry for help’ simply because they can see flames from afar, say, at night. And whilst the flames themselves will be your closest ally in being spotted at night, it’s important that you understand the basics of building a fire that is designed to summon help. Basically, you need to build 3 separate small fires and set them in a triangular pattern about 100 feet apart. If the space you have doesn’t allow for a triangular shape, set 3 fires the same distance apart in a straight line instead. It’s the ‘three’ fires that is the internationally recognised distress signal. In daylight however, the brightness from the flames is not going to have the same impact so you need to draw attention to your plight by setting your fires to produce as much smoke as possible as opposed to flame. This is easily achieved by putting lots of green vegetation on top of your existing fires. The vegetation won’t burn but it will create a lot of smoke which can alert potential rescuers both in the air and on land and water. Obviously, once you have started signalling for help, you want to remain as close as possible to the signal source and don’t go off wandering into the forest. Some kind of small mirror should always form part of your emergency survival kit. However, even if you haven’t brought one, any shiny object will serve the same purpose - some kinds of watches, glasses, a steel knife, a belt buckle, for example. In fact, you can use anything which can reflect the sun’s rays. This strategy often works best when you’ve some kind of concrete evidence that humans aren’t too far away. Examples might be a boat or ship on the distant horizon, or aircraft which are passing overhead or perhaps you’re at altitude overlooking a village much further down the hillside. Basically, you need to work out where you want your signal to go by practising reflecting the sun’s rays off a nearby object in the line of sight of where you want your signal to be seen. Use your free hand as a sight line then send out the internationally recognised SOS signal - that’s 3 short reflections followed by 3 longer ones then complete the set with another 3 short ones. Signalling using a mirror can take some practice and you must keep remembering to keep readjusting your position as the sun moves across the sky. In some survival situations, human help may not be too far away so, if you have a whistle, you might as well give it a try occasionally. Once again, follow SOS procedures by giving 3 short blasts, followed by 3 longer ones then another 3 shorter ones. Then stop for a few minutes to listen out for any kind of response then repeat again. By following all of this advice, you’ll be better placed to get out of your predicament more quickly but think about it first as rushing your signalling plans can make them pretty ineffective.